Still looking for new shoes to buy this Spring? I narrowed down to these two most extraordinary pieces from Christian Louboutin and Sergio Rossi. 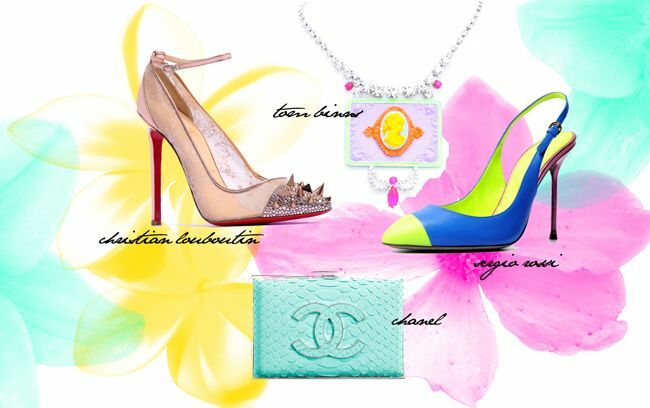 Plus, complete the look with some eye-catching accessories like these from Tom Binns and Chanel. Here's the breakdown. 1. Christian Louboutin Potpourri Spiked Toe and Lace Pump, Picks & Co. in rose gold with crystal studded cap-toe, retailing at Rp. 18 million from On Pedder Jakarta. Tel. 62 3192 7853. Words are that the Singapore store will carry them in gold. They're also available online for USD1495 here. 2. Sergio Rossi Cap-toe Fluoro Multicolor slingback, available at On Pedder for SGD920. They're also available in neon pink at Luisa Via Roma. 3. Chanel Python-Embossed Velvet Clutch in turquoise, SGD4700 at Chanel boutique. 4. Tom Binns Multicolor necklace, available at On Pedder for SGD1070. View more pieces here. heart the blue Chanel Python clutch!! area which is a pleasant contrast to the colourful chaos of the http://www.bolsosonline.eu resort centre.